SKU: IR-5010. Category: IR Repeater Systems. Easily connect and control AV devices and Security DVRs located behind closed doors up to 1,000 feet away. The IR Repeater Plasma Proof Kit – IR-5010 has a compact design that allows for the hub of the IR system to stay hidden inside the equipment cabinet while the tiny IR receiver head is placed in an inconspicuous location. Included accessories allow for versatile mounting – on a TV, flat surface or flush mounted. The IR Repeater Plasma Proof Kit – IR-5010 features advanced IR filtering for the best performance in situations where there might be interference from Plasma TV’s, LCD displays and Sunlight without affecting performance. Channel Vision’s IR Repeater Plasma Proof Kit – IR-5010 includes a status LED for signal indication or interference. The status LED provides the user assurance the IR signal has been received and makes troubleshooting easy. With the IR Repeater Plasma Proof Kit – IR-5010 control 4 devices up to 1000ft. away using a single CAT5 cable between the IR Hub (IR-1203) and the IR Receiver (IR-2400). 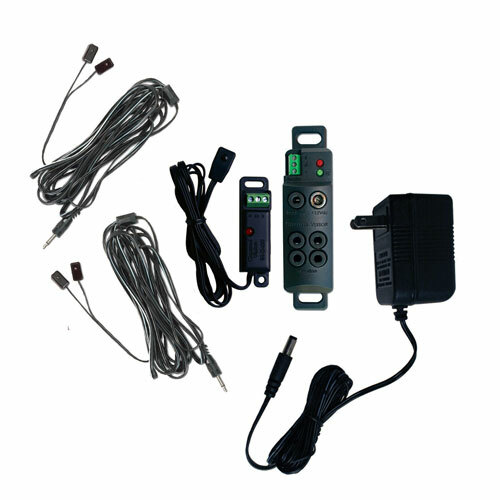 Add 2 more dual head IR emitters (IR-3002) to control up to 8 devices total.